While I've always liked the scent of lavender, I never gave it much thought. 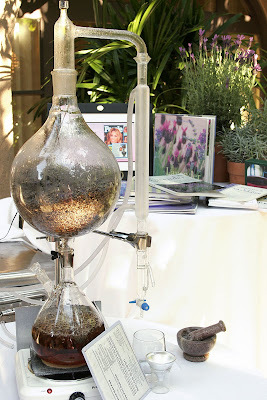 However, I now have a deeper appreciation and understanding of the plant after attending the Fall Lavender Harvest Festival at The Langham Huntington in Pasadena. 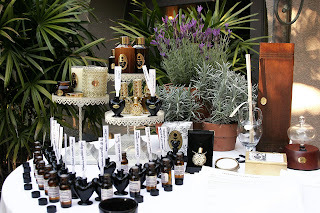 The event celebrated all things lavender and included a live lavender distillation demonstration, lavender infused desserts, educational sessions covering the history and health benefits of lavender and 15 different types of lavender essential oils to sniff. There are approximately 39 different lavender species and over 300 variations. An infusion of lavender is claimed to soothe and heal insect bites and bunches of lavender are also said to repel insects. Lavender is frequently used as an aid to sleep and relaxation: Flowers buds of the plant are added to pillows. Lavender oil is claimed to heal acne. Lavender will grow in nearly any climate - with the likely exception of the arctic. It does best in Mediterranean climates though. Interesting. Lavendar induced soap is such a clean smell. BTW, Your pocketbook looks good with the shirt. 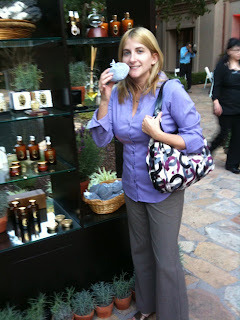 I love lavender and of course, this post :-) My favorite lavender products are lavender gum, tea and creme brulee. I would love to bottle up that signature scent in the Langham - I love it.